How to license your music for TV and movies WITHOUT making mistakes. While the music industry has gone through a series of seismic shifts over the last 10-15 years, music licensing still remains a good potential revenue stream for songwriters. 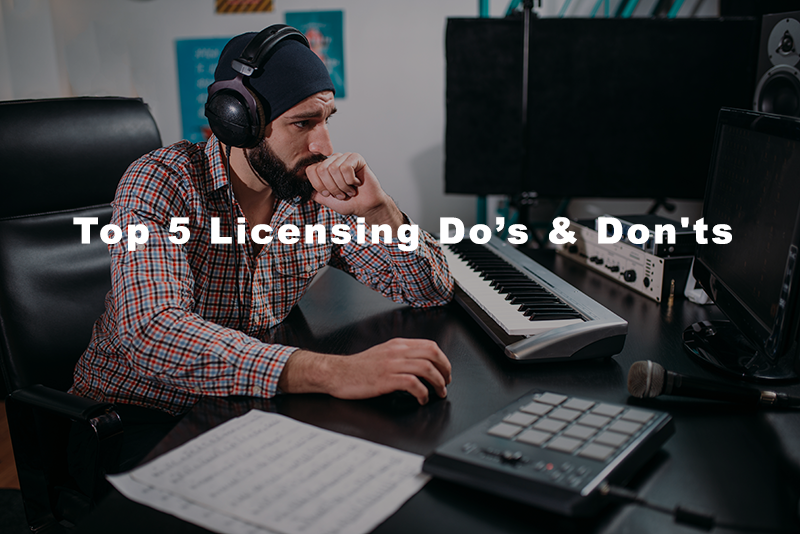 If you’ve done the research and decide to take the plunge into licensing your music, there are pitfalls to avoid just as there are tips to ensure success. Here’s a list of top 5 do’s and don’ts. Don’t Forget to Research Before You Send – Pitching with purpose is quite possibly the most important element. Know exactly what show or production each specific song is being pitched for and be POSITIVE it is a great fit. It’s also good to know the timeline of the production you’re pitching. For example, if you’re pitching a series that’s about to shoot the season finale, then you’re better off waiting and pitching before the next season begins. Artists can use resources like Tunefind to locate music supervisors and get a better understanding of the type of music they work with. Here’s an episode of The Music Biz Weekly Podcast with Michael Brandvold and Tunefind’s Managing Director Amanda Byers explaining how it works. Don’t Send Extra Tracks – Send only the songs that would be a great fit, no extras. Busy music supervisors will only get irritated and no one has the time or interest to hear all your material. You want to make their job as easy as possible, so be sure to only include tracks that are a great fit for the supervisor / production. ArisTake has some great tips on how to prepare your contact email to a music supervisor (see the section entitled “How To Contact Music Supervisors”). Don’t Call Us, We’ll Call You – Once you’ve pitched, give it some time. If you haven’t heard anything after a week or two, follow up ONCE, and then leave it alone. If the supervisor you’ve pitched to feels the song would work well, they’ll definitely contact you. It’s a good idea to keep a calendar or spreadsheet of who you’ve contacted just to be sure you don’t accidentally contact them multiple times. Don’t Skip The Networking – Having personal connections and being a member of organizations like ASCAP, BMI and SESAC will help tremendously. Go to networking events like NARIP Music Supervisor Pitch Sessions to get your name and face out there. Shake a lot of hands! Don’t Forget Metadata! – Metadata in your music files is imperative for supervisors to find your tracks. Include your name, contact info, song title, genre, etc. There are a lot of tracks to keep track of! Do Master Your Tracks – It may be an extra cost, but mastering ensures all levels are even and will only present your music more professionally. Don’t forget, you’re competing against major label releases that are produced to perfection. We know some great mastering engineers for hire! Do Keep Your Lyrics General – You may love your song about that time your boyfriend took you to an Italian restaurant in his red convertible while Elvis was playing on the radio, but it will be a long shot for licensing. Anything too specific will be too difficult to place. Stick with common topics: love, dancing, victory, heartbreak, etc. Do Make Strong Instrumental Tracks – Keep in mind that TV and movies involve dialogue. Standout instrumental tracks give the supervisor more freedom of song placement. Also, it’s not uncommon for music supervisors to request an instrumental version of your track. If you don’t have those at the ready, it can be a deal breaker. It’s good to consider this before mixing and mastering begins, because you may want to treat the instrumental versions slightly different with the vocals dropped out. Do Have Your Marketing In Place – This rings true for anyone in business nowadays. Have either an EPK or website with your social media accounts just in case a supervisor wants to do a bit more research on you. With these in place, you present yourself as a professional that has their act together. Do Partner With A Song Plugger Or Publisher – Don’t shy away from sharing a cut. These key players can pitch to supervisors on your behalf and get you through doors you’d never get to open on your own.